In a bid to make accident-free mobility a reality, especially in India, Bosch gave us a glimpse into how it is planning to tackle road safety challenges through numerous technology-based solutions. 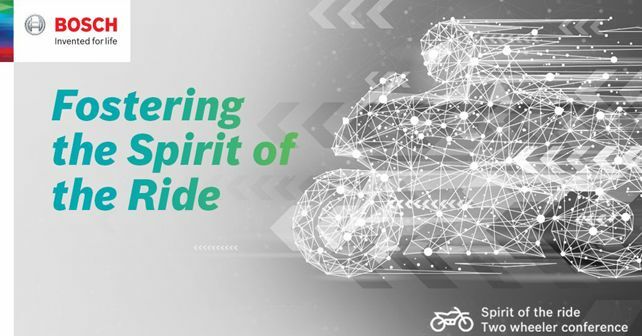 During the Spirit of the Ride Conference 2019 organised by Bosch, the global and Indian heads of Bosch's Two-Wheeler and Powersports division, namely Geoff Liersch and Prabhu Panduranga, respectively, took us on a nostalgic journey which began by tracing the origins of the first two-wheeler in India. From there, the main focus of the conference shifted to the deteriorating safety record of countries like India in terms of road safety, alluding particularly to the number of two-wheeler accidents which take place in the country annually. According to a report by the Ministry of Road Transport and Highways of India (MoRTH), up to 34 per cent of road fatalities in India involve riders on two-wheelers. In a bid to tackle this challenge and to take the first steps towards accident-free mobility, Bosch began as early as 1995 when it introduced the first ABS system for a motorcycle. During the conference, Mr Liersch talked about the numerous advancements Bosch has achieved over the years in terms of safe riding technologies and how it has also penetrated into the Indian two-wheeler industry. These advancements have been achieved using a three-step process: The first step makes use of Bosch's MSC function (Motorcycle Stability Control) which in essence, is ABS 2.0. Like the standard ABS regulates braking in order to avoid wheel lock-up, the MSC goes a step further and analyses the speed and lean angle of the bike before sending the requisite amount of braking force. With this, riders can even press the brake pedal fully while manoeuvring and they will still be able to make the turn without the wheels locking up or the bike losing its balance. The second step involves predictive braking/deceleration and high-speed alert systems. For this, Bosch makes use of its radar-guided Adaptive Cruise Control along with Rear Blind Spot indicators and Forward Collision Warning, which also work through radar guidance. The last step, according to Bosch, is to connect the bike with its environment through motorcycle-to-vehicle communication. For this, numerous connectivity features like multiple Bluetooth channels are used, which also includes Bosch's mySPIN system, which allows the rider's smartphone to be integrated with the bike's display. Using this, the rider can access and see the phone interface on the bike's screen. According to Bosch's accident research estimates, these radar-based assistance systems could prevent one in seven motorcycle accidents. While the ABS and MCN systems are being deployed currently, the radar-guided safety features from Bosch will go live in the markets with Ducati and KTM models by 2020. With stricter emission norms on the forecast, Bosch is also working on generating solutions for cleaner mobility. 'We at Bosch are working towards ensuring a smooth transition to the new emission norms with a tailored product portfolio for the Indian market supporting vehicle manufacturers with local engineering competence - aiming towards realizing the vision of nearly emissions-free mobility,' said Prabhu Panduranga, India Head, Two-Wheeler & Powersports Business Unit at Bosch.